If you are a big fan of Elk Studio's video slots, this fantastic game with the Bloopers will not get you off guard. The developer has used Bloopers (minions gamblers) to create an immersive and action-packed video slot with a military theme. This game will give you the opportunity to join the ever smiling platooners in the war with poisonous Serpents, which protect a considerable amount of gold. Battle with the heroes and defeat the snakes and you could walk away with whopping250,0000 coins from a single spin! The Platooners are heavily armed with grenades, rocket launchers, and bullets to help you triumph over the enemies. Prepare your perfect war strategy and join the Bloopers in this five reel, three rows, and 178 beltways video slots. 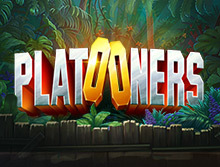 The Platooners is a fully optimized video slot and can be played on smartphones and tablets without losing the original graphics and gameplay quality. You will enjoy playing with a high theoretical return player of 96.3% and a variance ranging between medium and high. The slot is all set to a Hollywood movie backing, which makes it immersive and fun to play for both beginners and veteran gamers. The jungle warfare theme has been widely used in online video slots, but no developer has been able to make it as thrilling as the PLatooners from Elk Studios. The slot - Platooners - is not only quirky but lucrative as well. The background of the slot is film or movie studio, well designed with the director's chair, spotlights and some lush jungle vegetations. You will enjoy high quality impressive visual graphics and animations and seamless gameplay. As you would expect from Elk Studios, the character designs are very detailed and with both dim and bright lights, to give the slot a perfect interface. Also, the ambient soundtrack (which can be muted at one's will) will provide the feeling of a real jungle, and th sound effects that will be made during the spin rounds will bring back fresh memories of 90s TV cartoons. Optimizer Strategy: The bet levels changes automatically, adapting to the selected percentage of your balance. Leveller Strategy: It raises the bet two levels after five consecutive losses. Arepition will increase the stake two more levels for example 10 times the base chance. It resets after a win. Booster Strategy: It raises the bet one level after a loss until reaching four levels above base bet, for example, ten times the base chance. It also resets after a win. Jumper Strategy: It raises the bet one level after every winning round until reaching four levels above base bet, for example, ten times the base bet. The level resets after a loss. The main rivals in Platooners video slot are three soldiers colored Green, Red, and Yellow. The three symbols do not appear as regular symbols because they are randomly called when one of the three random game features is activated. The Snakes of Fortune represents the scatter symbol, and it enables the Bonus Feature. All the soldiers in the game use military tools such as the Army Tags, Binoculars, Medic Kits, Knives, which represent the great value symbols. The standard playing card symbols marked with letters J, Q, K and A on the screen represents the low value symbols. The Arm Tags symbols have the highest value and pays up to 1000 coins for landing five of a kind. Platooners video slots feature a Wild symbol which can replace any other logo on a connecting payline except the scatter symbol. The scatter symbol is represented by the Snake, landing three or more of these symbols will trigger the Bonus Game: Platooners vs. Snakes of Fortune. Every additional bonus scatters an extra Platooner attack per round. Green Platooner: He will use the rockets to fill reels 1 and 3 with matching symbols for a single spin. Red Platooner: He will through his grenades on the reels to add random wild symbols on reels three, four and five. Yellow Platooner: He will shoot his bullet from the heavy machine gun from reels two up to reel 5 and forms at least one five of a kind winning combination on the reels. Platooners video slots are built with the latest modern technology such as HTML5 and Java. This means that you can play this slot on smartphones and tablets running on Android and iOS without losing the original high quality visuals and smooth gameplay. Being an instant play slot, you don't have to worry about downloading any application on your device. Just log in your favorite mobile casino such as bCasino and enjoy an extensive collection of exciting video slots on the go. The main supported mobile browsers are Chrome, Opera, Firefox and Safari. If you are looking for a perfect online casino site where you to play Platooners and another interesting slot from Elk Studios company, look no further. bCasino is a young UK based gambling site which is owned and operated by the GS Technology Ltd. Despite being young in the gambling industry, we have built a good business relationship with more than ten giant software developers. We have a generous welcome bonus offer to all our new customers who make a minimum deposit of $20. This includes up to $1200 bonus amount plus additional free spins. The UK Gambling Commission fully licenses our site and secured by the latest 128-bit Secure Socket Layer (SSL) encryption software to ensure that your personal information does not leak to third parties. Also, our customer support agents are highly trained and friendly, and you can contact at any time via email, live chat or telephone. Signup at bCasino today and be the next jackpot winner with Platooners slot game.